Welcome to our website. This website with URL address http://www.flourishingfamilies.com.au is owned and operated by Flourishing Families Holistic Nutrition (39807177410). The term ‘Flourishing Families Holistic Nutrition’ or ‘us’ or ‘our’ or ‘we’ refers to Flourishing Families Holistic Nutrition, the owner of the website, whose registered office is ABN: 39807177410, New South Wales. The term ‘you’ or ‘your’ refers to the website user. By visiting our site and/or purchasing something from us, you engage in our “service” and agree to be bound by the following terms and conditions (“terms of service”, “terms”), this includes any additional terms and conditions and policies referenced herein and/or available via hyperlink. All users of the site are bound by these terms, including without limitation users who are browsers, vendors, customers, merchants and/or contributors of content. The content of this website is for your general information and use only. It is subject to change without prior notice. 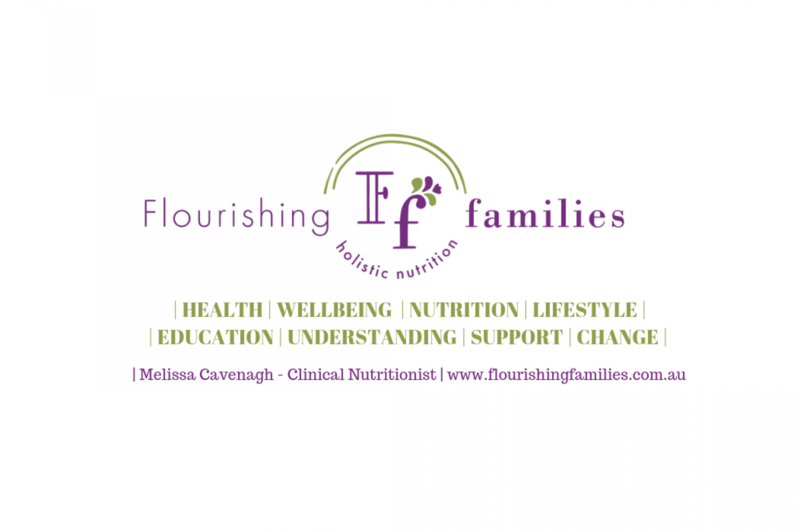 Melissa Cavenagh trading as Flourishing Families Holistic Nutrition is not a medical doctor and cannot diagnose or cure medical conditions. The information on this website is not intended to take the place of consultation with a medical professional. Prior to making any changes to your current medical treatment or discontinuing medications, you should consult your primary doctor. This site is intended for use of those over 16 years of age, use of the site by those under the age of 16 years, must seek adult consent to interact with the site. It is assumed that those under 16 years of age are using the site with the authorisation of their legal guardian. Neither we nor any third parties provide any warranty or guarantee as to the performance, accuracy, timeliness, completeness or suitability of the information and materials found or offered on this website for any particular purpose. You hereby acknowledge that such information and materials may contain mistakes, inaccuracies or errors and we expressly exclude any liability for such to the fullest extent permissible by law. Your use of this site is taken as an understanding that the information contained on the site is for general purposes and should not be relied on for making decision about your health, without consulting primary, more accurate and more complete sources of information, such as your primary physician. Any reliance on the material on this site is at your own risk. Age Requirements: Online purchases for consultations and meal plans (both individualised and pre-packaged) are for the purchase of those over the age of 18 years. If you are under the age of 18 years it is assumed, that you have sough permission from your legal guardian to make the purchase and consent has been given for any minors to use this site and also make purchases. Online consultations with those under 18 years of age will not take place without the consent of a guardian. General Conditions: We reserve the right to refuse service to anyone for any reason at any time. This site uses PayPal to receive payments and you understand that your content (not including credit card information), may be transferred unencrypted and involve both transmissions over various networks and changes to allow adaptation to the technical requirements of connecting to another network or device. Credit card information is always sent encrypted and we use PayPal as a payment method to ensure your details remain safe and protected. You agree not to reproduce, duplicate. copy, sell, share, resell or exploit any portion of the Service, use of Service, or access to the Service or any contact through which the Service is administered through our website, without express written permission from us. This includes but is not limited to treatment plans obtained via online consultations, meal plans obtained via the pre-packaged plans, meal plans obtained using our individualised meal planning services, programs, ebooks, products or any other product or service that is made available on our site. You may not use our products or services for any illegal or unauthorised purpose, nor may you violate any laws governing your jurisdiction, which includes but is not limited to any copyright laws. You must not transmit viruses or worms or any destructive code to or via our site. A breach or violation of any part of these terms and conditions, will result in immediate termination of your service. Modifications to Services and Prices: Prices for our products are subject to change at any time, without notice. The price listed at the time of purchase is the sale price, unless a coupon or discount code has been offered, this is solely at the discretion of Flourishing Families Holistic Nutrition. Should you view the price and this change before purchase, we are not responsible for or required to provide the product at the previously advertised price. We reserve the right at any time to modify or discontinue the Service (or any part or content thereof) without notice at anytime. We shall not be liable to you or any third party for any modification, price change, suspension or discontinuation of the Service or product sale. If this applies to a membership where continued payments are taken on a direct debit basis, deductions will be ceased and you will be notified. Meal Plan Terms & Conditions: Purchases of either pre-packaged or individualised meal plans are for the purchaser only, you may not reproduce or share the any part of the content with other parties. Should other parties wish to use the meal plans, please direct them to the website to purchase their own copy. Sharing these plans with a third-party or reproducing and/or reselling of any part of the meal plan is prohibited and will be considered as copyright and a breech of these terms and conditions. Products & Services: Some services and products may be exclusive to online services only and we reserve the right, but are not obligated to limit the sales of products or services to any person, geographic region or jurisdiction. This may be exercised on a case-by-case basis. We do not offer a warranty that the quality of any product, service, information or other material purchased or obtained by you, will meet your expectations. Should you have any concerns with the product/service or complaints please contact us at [email protected] and we will endeavour to rectify the situation. We do not however, confirm that any refund or compensation for unmet expectation or change of mind, will be provided. Please ensure you read the description of the product before purchase, as refunds are not offered (unless specified in the description). Accuracy of Billing & Account Information: We reserve the right to refuse any order you place with us, at our discretion. These restrictions may also apply to those living at the same billing address, using the same customer account, the same credit card and/or the same email address. Should we make a change to or cancellation of your order you will be notified via the email address provided. It is your responsibility to ensure a correct email address is supplied at the time of purchase. We reserve the right to limit or prohibit orders that, in our sole judgement, appear to be placed by dealers, resellers or distributors. You agree to provide current, complete and accurate purchase and account information for all purchases made at our store. You agree to promptly update your customer information, which includes your email address and credit card details (including expiry date), so that we can complete transactions and contact you. For further information please refer to our Returns & Refund Policy. Optional Tools: We may provide you with access to or we may use, third-party tools over which we have no control, nor do we monitor: this includes but is not limited to PayPal and Zoom Meeting Room. You acknowledge and agree that we provide you with access to these third-party tools “as is” ans “as available” without any warranties, representations or conditions of any kind and without endorsement. We shall have o liability whatsoever, arising from or relating to your use of the optional third-party tools. We may also in the future offer additional optional tools, new services and/or features through the site (including the release of new resources). Any new features and/or services shall also be subject to these terms and conditions or service. Third Party Links: Certain content, products and services available via our Service may include materials from third parties. Any third party links, may direct you to a third party website that is not affiliated with us and that we have no control over. We are therefore not responsible for examining or evaluating this content or its accuracy, we do not offer any warranty or protection from interactions that occur with these third parties. This includes their information, products, services, resources or materials gained via interaction with the third-party site. We cannot be held liable for any harm or damages related to the purchase of goods, services, content, materials, resources or any other transactions made with these third-party sites. It is your responsibility to review carefully the third parties policies & procedures and access their services at your own discretion and risk. Our Rights: The failure of us to exercise or enforce any right or provision of the Terms & Conditions shall not constitute a waiver of such right or provision. These terms and conditions and any separate agreements whereby we provide you Service, shall be governed by and construed in accordance with the laws of the State of New South Wales and the Commonwealth of Australia.